Ever since the 2011 unveiling of the Galaxy Tab 7.7 we've been waiting for the next generation of Super AMOLED tablets. Three years later they have arrived - the Samsung Galaxy Tab S duo comes in 10.5" and 8.4" sizes and like the Tab 7.7 before them, they are stunningly thin. 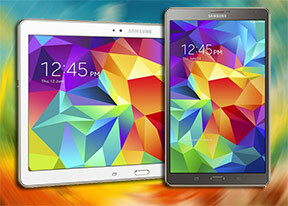 Separate from the Galaxy Tab and Galaxy Note lines, the Galaxy Tab S tablets still share a lot with them. The powerful hardware platform, combined with proprietary TouchWiz features like Multi Window, instantly put the two at the forefront of functionality. Just look at that specs sheet. The key difference between the Galaxy Tab S and other Galaxy tablets is clearly the screen. Samsung's return to Super AMOLED for its tablets means the slates offer stunning contrast, rich colors and on a more practical note great sunlight legibility. The leather-like finish of the plastic back has been updated to the perforated look ala Galaxy S5, while the home buttons now host fingerprint sensors dubbed S fingerprint. At just 6.6mm thick these two pose a serious challenge to the Sony Xperia Z2 (6.4mm). Unfortunately, these two didn't inherit the Galaxy S5 water resistance along with its looks. Samsung leads the way among Android manufacturers with Multi Window - allowing split screen view with several open apps. Multitasking is growing in importance - Microsoft touts it as a key Surface feature and even Apple might be taking the split-screen plunge soon. Samsung's customizations to Android, of course, extend much further than that, but Multi Windows will seem to be a key selling feature for a while. After three years of waiting there's a lot of anticipation for these tablets so without further ado, flip over to the next page for our first glimpse at these gorgeous Super AMOLED screens. This tablet is poorly optimized.